Vera Bradley used to make Christmas/winter/holiday prints....like Hens-n-Holly, Red Holiday, Holiday '95, Noel '93, Noel Coordinate, and Blue Holiday. My friend gave me a piece of Laurel that I might consider a holiday print, it has mini wreathes on it. These prints can be seen on the Classic Colors page on the Vera Bradley website. Yesterday I was walking out of my building and noticed that we only have a few green tree left, the rest have already lost their leafs. One of the trees is a Holly Tree! We don't have those in San Diego, or if there happens to be one I never noticed it. So it got me thinking about about those old retired holiday bags that Vera Bradley used to make. I think that it would be fun to have a holly bag. I guess I will have to start keeping an eye out on ebay for one. 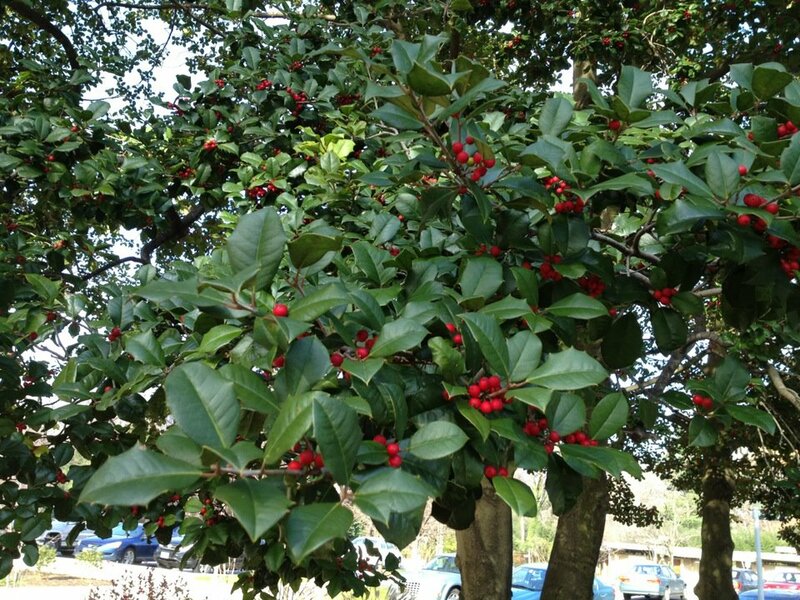 Now that you are on the east coast, you will see a lot of American Holly. It's a beautiful tree but it sure does grow big! I agree that a holiday/winter print would be great. I guess you could argue that Suzani is kind of a holiday print since it looks like ornaments, but I would love a winter print like VB used to do in the past. Traditional red and green would be great, but white and silver snowflakes against a midnight blue background would be awesome as well!